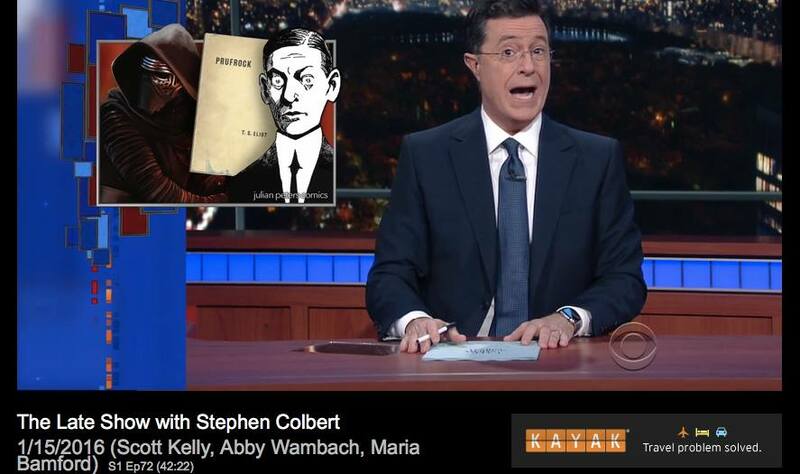 J. Alfred Prufrock on The Late Show with Stephen Colbert! Last night’s episode of The Late Show with Stephen Colbert featured a “Friday Night Fights” showdown pitting T. S. Eliot’s coffee-spoon-wielding time murderer J. Alfred Prufrock against Darth Vader’s grandson and known Universe disturber Kylo Ren, from the new Star Wars movie. And where did the show’s producers go for a profile pic of Prufrock but an image from the comics adaptation of Eliot’s poem by yours truly! Many thanks to Lia Bassin and all the other members of the Late Show team for making this happen! This entry was posted in "The Love Song of J. Alfred Prufrock" by T.S. Eliot, comics, Poetry and tagged kylo ren, lia bassin, star wars, T. S. Eliot, the late show with stephen colbert. Bookmark the permalink. 8 Responses to J. Alfred Prufrock on The Late Show with Stephen Colbert! What a “hats off” to you work! Bravo! BTW- Pls if you are using my Ripnet address pls change to: rdelgrande@gmail.com. Thanks! Congratulations! Here’s hoping this will help motivate a publisher to do what one should have done long ago. Even though I’ve read the thing on-line more than once, I would definitely buy a hardcopy–maybe several. And I might well order copies for my students as an assigned text. That’s exciting! I’m still waiting for the moment your Prufrock is in print so I can buy a copy or several.